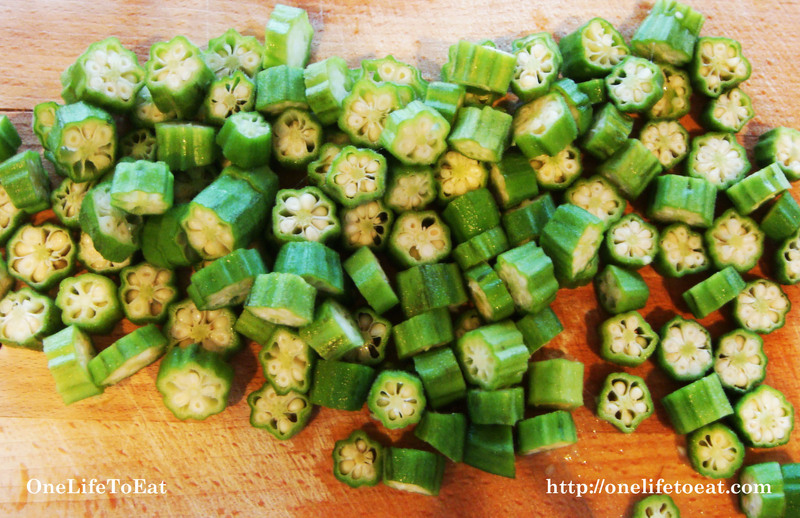 Okra, also known as Bhindi in Hindi and Bhinda in Gujarati wasn’t always as favored a vegetable as it is for me today. Firstly, it was green. And as children, didn’t we all find anything green, ooky? Secondly, it was slimy. And that directly put this vegetable in the never-touch-this-or-you-will-puke category at the dinner table. My mother tried to force me to eat it, coming up with ways to make it yummier for me. As an adult, I learned that the only way I enjoy okra is when it is cooked till crispy, lightly spiced and garnished with copious amounts of coriander and lemon juice. Cooking the okra till crispy ensures they are not slimy. 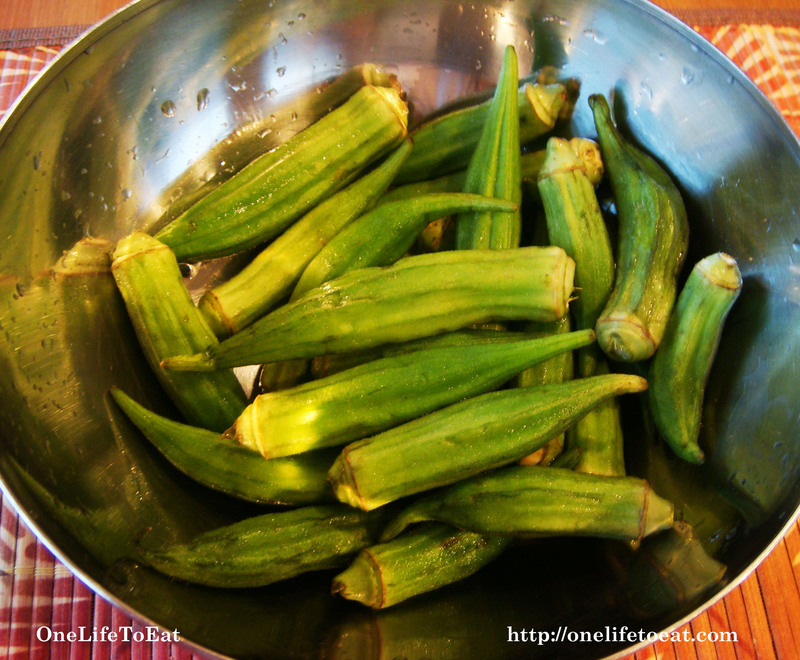 In South India, crispy okra is used as a side dish to yogurt-rice and other rice dishes. 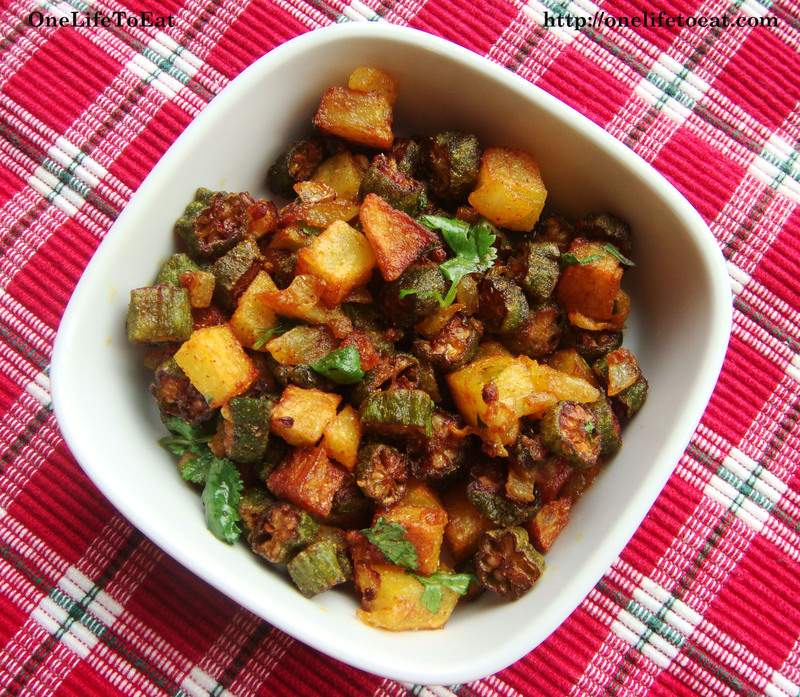 The Gujarati’s, make it crispy too, but with potatoes and lightly flavored with onions and spices. My version is an in-between. I love using fresh okra as they have the best flavor. If you’re pressed for time, you can also use the frozen variety that comes sliced and ready to use, found in most grocery stores. This recipe serves 2. Get a printable version of the recipe here. When the cumin seeds begin to crackle, add the onions and let them soften on low-to medium heat. Finally, garnish with a handful of chopped coriander or cilantro leaves. Add lemon juice if desired. Enjoy with some Roti’s or as a side to Yogurt Rice. excellent dish but enhance it with chopped fresh tomatoes and some tomato paste prior to adding okra and potatoes in the frying pan. Thanks for the suggestion, Navroz! The tomatoes would add a nice tang to the dish… must try it.